The Partner Admin app is designed for Microsoft Office 365 partners who manage clients with the Office 365 Partner Admin Center. With the Partner Admin app, you can work with your clients as if you were signed in to the Office 365 Partner Admin Center with your browser. 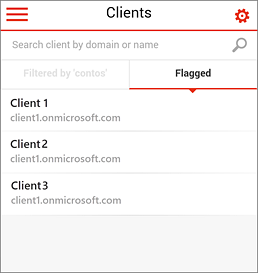 View your service incidents, update support tickets, and reset passwords. Who can download the app and how much does it cost? The app is free and anyone can download it. What are the minimum user requirements? There are several requirements that must be met prior to signing in to the app. For starters, you must have an Office 365 organization account with admin permissions. When starting the app for the first time, you will see the sign in screen. Sign in with your Office 365 administrator credentials. 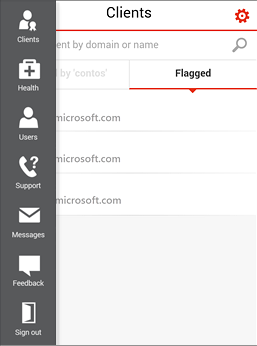 Does this app support Windows Azure Active Directory Multi-Factor Authorization? No. Service environments configured with Windows Azure Active Directory Multi-Factor Authorization will not be able to log into their service and will receive an error message. There could be several reasons like not having a valid Office 365 tenant with administrator rights or having an invalid username and password. How do I change how often my data is updated? The data refresh setting can be found in Settings. You can set it to automatically refresh every 15 minutes, 30 minutes, or manually updated. What are the supported mobile device platforms? Windows Phone 8, Android 4.2.1 and up, and iOS 7. Will this app work on tablets? Yes. Any Android tablet running Android 4.2.1 and newer. iOS 7 will run this application similar to the phone experience. It runs in either small or scaled up modes. Windows Phone in English, Brazilian, Portuguese, French, German, Japanese, Spanish, and Traditional Chinese. Android device on English. iOS on English. How can I see my own tenant’s information? Press the menu icon and select Clients. Without selecting a client, press the menu icon again and select the information you want to view (users, service health, messages, etc.). Learn more about the Partner Admin Center. Find help for partners. To get the Office 365 Partner Admin app, search for it from the app store on your phone. Open the app store on your mobile device. Search for Office 365 Partner Admin. Select the app from the list of available apps. 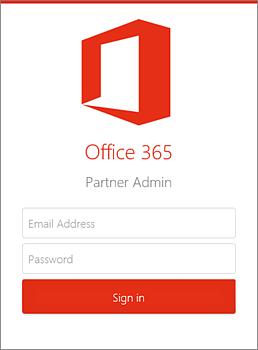 Sign in to the Partner Admin app using your Office 365 organization account. Tip: An Office 365 organization account with admin permissions is required. On the sign-in screen, enter your Office 365 organizational email and password. This takes you to your clients list in the Partner Admin app. Touch the menu icon in the upper left. Use the left navigation menu to navigate the Partner Admin app (see below). Use the left navigation to work with your clients. Takes you to the Clients screen where you can work with your clients' Office 365 tenants. Select a client to view their service health, service incidents, and reset passwords. The selected client becomes the default as you navigate the app. Choose Clients to select a different client. Flag clients you work with the most. Search for clients using their default domain name. Healthy workloads are green. Unhealthy workloads are yellow and red. Select a workload with recent service incidents to see the issue. Shows all or recently viewed users of a selected client. Select users to view their contact card. Search for users by name. View open and closed support tickets of selected clients. View and edit each support ticket on behalf of the client. View individual messages from the Message Center for each client. Send us feedback about the Office 365 Partner Admin app. Sign out of the Partner Admin app. Touch the settings icon . Choose Sync Frequency to change how often the Partner Admin app downloads content. Choose Every 15 minutes, Every 30 minutes, or Manually. Choose Feedback to send feedback to us regarding the app.